See us on Radio 3's Musical Map of Britain! 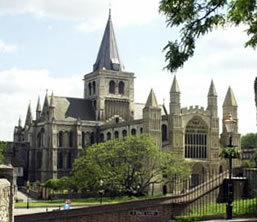 The Society was formed in 1873 and has performed regularly in Rochester Cathedral since 1922. We are a friendly choir that rehearses at the Vines Church, The Terrace, (off Victoria Street), Rochester [map] on Tuesday evenings at 7.30. New members are always made welcome. Please contact us if you wish to join, so that we can welcome you at your first rehearsal. Please click on the menu items on the left to find out more about us.